Every piece of plastic created still exists somewhere. It’s a scary thought and one that reminds us of how important it is to choose reusable over disposable. It just doesn’t make sense that we use items just once that will last on the planet forever. Every time we say no to a straw, bring our own bag or take our Keep Cup to the coffee shop we are avoiding using an item that will be on around longer than our children and our children’s children. And that’s powerful. Last Saturday, the Northern Beaches community gathered to clean Manly Cove, learn more about the marine animals that call our ocean home and watch the documentary, ‘A Plastic Ocean’ on an outdoor screen as the sunset. Hosted by SO Manly and the Northern Beaches Council, it was a celebration of our oceans and what we can do to help. A beach clean of Manly Cove kicked off the evening. Volunteers collected more than 750 cigarette butts, 60 straws, 20 plastic bags and 36 plastic drink bottles and even a broken guitar. More than fifty percent of plastic created is used just once and then tossed away. Eight million tons of different plastics make their way to the ocean on an annual basis. By 2050, every seabird on the planet will have ingested plastic and there’s predicted to be more plastic than fish in the sea. Statistics like these are pretty overwhelming, and while the movie ‘A Plastic Ocean’ might have left you feeling inspired to act, the problem of plastic pollution is so immense that it can be hard to know where to begin. But, fortunately, there are plenty of reusable alternatives to disposable plastic items. Most of these are available online or at the Manly Food Co-op. Imagine the collective impact we could have if we all said a big, resounding NO to single-use plastic and made the following choices instead. At the event on Saturday night, we were lucky enough to have wholesome treats provided by Burbury Wholefoods, whose ethos for sustainable food without plastic packaging is the foundations of their business. Tash Burbury, founder of Burbury Wholefoods has a passion for sustainable food and likes to experiment with natives like wattle seed in her recipes, which are far better suited to our climate. Burbury Wholefoods offers catering services so they’re a great option for your next event. When it comes to your own kitchen, you can avoid plastic food by shopping at a bulk food store. In Manly, we’re lucky enough to have a community run food co-op. Avoid plastic packaging on food by supporting this wonderful initiative. You can upcycle your glass jars and fill them with dry goods like pasta and rice. If you’ve ever seen a single sweet potato wrapped in cling film on a plastic try, you’d know the frustration that comes with shopping for plastic-free produce at the supermarket. Every Sunday, Manly holds farmers markets where you can buy delicious fruit and veg without the extra packaging. Farmers markets are run everywhere, so check out your local area to see if there’s one nearby. By choosing to shop at Farmers markets, you’re not only reducing your plastic footprint but also supporting local organic farmers who care about their practices. Navigating plastic in our bathrooms is a tricky business- the majority of cosmetics and body products come swamped in plastic packaging. But the more this plastic-free movement grows, the more options that become available. Did you know that 80% of a bottle of conditioner or shampoo is water? Ethique is a company that produces concentrated solid body bars, like deodorant, shampoo, and moisturizer. These bars last for a lot longer than your average bottle of shampoo, and best part – they come in biodegradable packaging. If you got a spare hour or two up your sleeve, you can try making your own beauty products. Most tutorials use ingredients you probably already have in your kitchen cupboard. Check out 1 Million Women for some delicious recipes. Tackling plastic pollution is all about creating new habits. If you can keep your new habit up for a month, you’re on a roll and it will only get easier and easier! Set yourself some ground rules, to begin with. Perhaps committing to only buying yourself a coffee if you have a reusable mug. Going one morning without caffeine because you forgot to pack your KeepCup will be enough of a reminder to pop your cup in your bag the next day! It’s fantastic to see big retailers moving away from plastic bags, but it’s important to remember that these will be replaced with an alternative that will have some impact on our environment, which is why the best option is to BYO Bag. There are awesome tutorials online about how to line your bin with newspaper if you’re worried about what to do now supermarkets aren’t offering plastic bags. Last week Dive Centre Manly and SO Manly ran a clean up of Manly Cove. Volunteers collected more than 450 straws in a single area. 4 of these straws were being held hostage by an octopus. This isn’t a unique story – hundreds of straws are found in Manly Cove on a regular basis. Cue, Operation Straw. Operation Straw is a collaboration between Dive Center Manly, SO Manly and Grumpy Turtle Design that will foster a sense of stewardship over Manly Cove - a beloved dive site- while simultaneously collecting information on one of the most harmful plastic items; straws. You can find out more and get involved here. Changed your own actions but are still hungry for more plastic-free goodness? 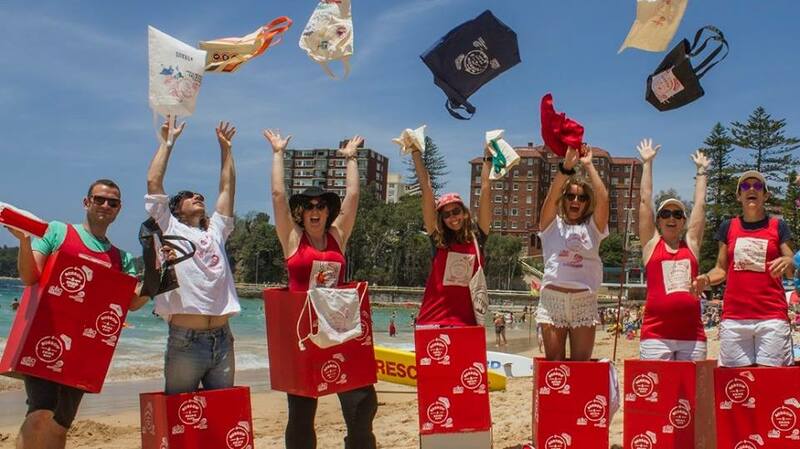 Along the Northern Beaches, there are so many dedicated groups and organisations targeting plastic pollution. A few are listed below if you’re interested in donating some time to a great cause. Plastic pollution is a huge issue. It’s overwhelming. It’s scary. But it’s a man-made problem, with a man made solution – we are that solution. As cheesy as it sounds, we are the change our oceans need to see. The outdoor screening of A Plastic Ocean was organised by Northern Beaches Council with the help of many community-minded folk. We'd just like to show our gratitude for the support of everyone involved including SEA LIFE Trust, Manly SEA LIFE Sanctuary, KALOF, Plastic Free Manly, Burbury Wholefoods, Berkelo Bakery, The Butcher & Chef, Suzy Spoon Vegetarian Butcher. Let's do it all again soon!